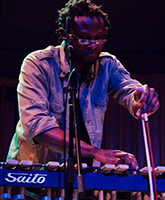 Corey is a Derby-based vibraphone player who is highly sought after for his original approach to the instrument. His playing and composition draws on a wide palette of sounds and influences. His main working band, a trio with Dave Kane and Joshua Blackmore has recorded and performed to much critical acclaim. Corey is one half of Musson/Mwamba with Rachel Musson. Mwamba, alive to every musical possibility thrown his way by his bandmates, was constantly selecting the precisely appropriate tone and timbre for the particular moment, either by changing gong-type (covered) mallets for xylophone-style (unwrapped) mallets, or by occasionally playing his instrument with his bare hands or a violin bow, drawing from its keys an astonishing variety of sounds, from mbira-like ‘muffled’ notes to ringing, sonorous, sustained tones or cascades of single notes, occasionally ending pieces with a subtle reverberating effect. Photograph of Corey Mwamba by Andrew Newcombe.